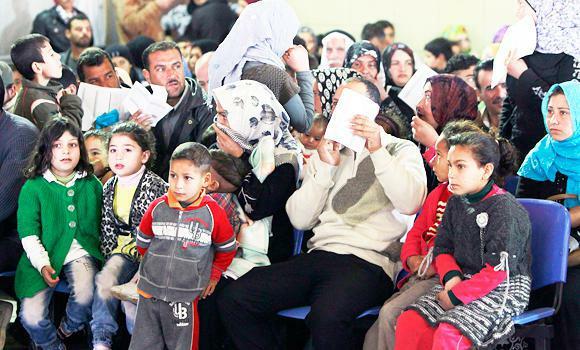 Syrian families wait their turn to register at the UNHCR center in the northern city of Tripoli, Lebanon. One million Syrians have fled their homeland since a revolt erupted two years ago, the UN said on Wednesday, as fighting between rebels and loyalists raged across central and northern battlefields. “With a million people in flight, millions more displaced internally, and thousands of people continuing to cross the border every day, Syria is spiralling toward full-scale disaster,” UN High Commissioner for Refugees Antonio Guterres said in a statement issued in Geneva. 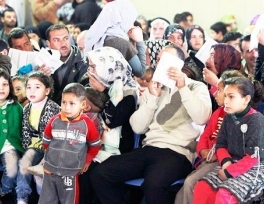 The UNHCR said the one million figure comprised both registered refugees and those awaiting registration, and that the count was based on fresh data received from its offices in the Middle East. Only a year ago, the UN agency had only registered 33,000 refugees. The exodus has intensified this year, the UNHCR said, with 400,000 Syrians fleeing their country since January 1. The refugees have fled primarily to Lebanon, Jordan, Turkey, Iraq and Egypt, but increasingly they are trying to reach North Africa and Europe, the UNHCR said. The UN’s announcement comes nearly two years after the eruption of what started as a peaceful uprising against President Bashar Assad but which escalated into civil war when the army launched a brutal crackdown on dissent. Guterres’ announcement came as UN emergency relief coordinator, Valerie Amos, said that in Syria four million people are in need of assistance and more than $1.4 billion in aid is required to assist them for the next four months. “We and our humanitarian partners are seeking $10.4 billion this year to help more than 57 million people in 24 countries with some of the world’s most pressing crises,” among them Syria, Amos said during a visit to Brazil. Guterres underlined the impact of the numbers, with Lebanon’s population having increased by as much as 10 percent and Jordan’s energy, water, health and education services being strained to the limit. Turkey has spent over $600 million setting up 17 refugee camps, with more under construction. Iraq, already struggling with a million internally displaced people, has received over one hundred thousand Syrian refugees in the past year. Syrian refugees complain of difficult living conditions. “Being a refugee I feel my dignity is compromised. People treat me badly just because I am Syrian,” said 20-year-old Abu Huzeifa, who is living in a crowded apartment in Beirut along with fellow refugees. “Thankfully I have a job, but I am underpaid. Sometimes, I think it might be better to go back to Homs,” in central Syria, said Abu Huzeifa, who fled the fighting in his country for neighboring Lebanon. On the battlefront, the army used warplanes and helicopters Wednesday to press a fierce four-day assault on rebel zones in the center of Homs, eight months into a suffocating army siege of parts of the central city, said the Syrian Observatory for Human Rights. “The army used helicopters to strafe the Old City district of Homs... and warplanes and rocket fire to strike the district of Khaldiyeh,”the Observatory said. Activists said there had also been fierce early morning ground clashes between troops and rebels defending positions on the outskirts of the neighborhoods still under their control. In Syria’s northeast, fighter jets struck the city of Raqa, two days after rebels overran most of the strategic provincial capital in their biggest victory since the start of the revolt, the Observatory said. The new fighting came after at least 159 people were killed in violence nationwide on Tuesday, among them 70 rebels, 47 civilians and 42 soldiers, according to the Observatory’s figures. The United Nations says in all at least 70,000 people have been killed since the start of the uprising.